Dr. Nguyen offers a range of cosmetic laser procedures to help refresh the skin, including treatments for wrinkles and small veins, hair removal, and fading of spots and scars. Her comprehensive laser treatment program is designed to fit and effectively address each patient’s individual needs. Dr. Nguyen is a Board Certified Family Medicine physician who has practiced in Montgomery County, Texas for the last seven years. Her practice serves patients from Conroe, Willis, Montgomery, New Waverly, Spring, The Woodlands, and Magnolia, Texas. Her patients come from Montgomery county, Walker county, and Harris county. Dr. Nguyen and her team are commited to taking care of you and your family with compassion, respect, and care they would give their own family. Unwanted hair is a common problem, for both men and women. Frequent hair removal chores including shaving, depilatories, plucking, and waxing are time-consuming, inconvenient and often painful. According to the American Society for Aesthetic Plastic Surgery, laser hair removal is the 3rd most performed non-surgical cosmetic treatment in the US. Dr. Nguyen can help you get at the root of the problem with the state-of-the-art Elite MPX™ laser system. Laser hair removal gives you effective, permanent hair reduction anywhere on your body that you have unwanted hair. Whether it’s your face, legs, back, or bikini line, you can have the results you want. During the procedure, a laser device emits light energy that travels through the skin and is absorbed by the pigment in the hair follicle and hair shaft. Pigments are the substances that give skin and hair its color (also known as melanin). The energy absorbed damages the pigmented hair follicle, which impairs its ability to grow. Hair follicles that are in the anagen, or active growth phase, have more pigment and absorb more energy, and typically respond the best to treatments. For this reason, it typically takes multiple treatments to achieve the best results – it’s important to “catch” your hair in this active growth phase when you are receiving treatments. 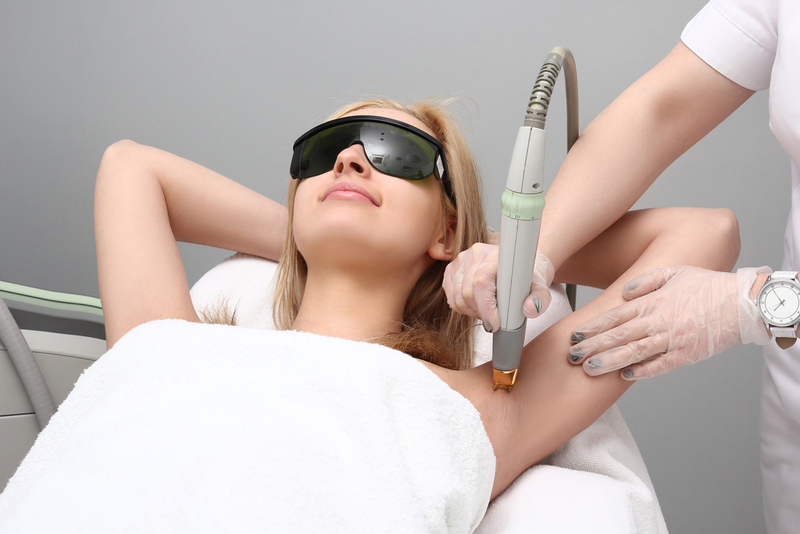 Laser hair removal can remove hair from faces, backs, chests, arms, underarms, bikini, legs and more. Different lasers can effectively treat different skin types. Our laser can be used on a wide range of skin types from very light to very dark skin. During your consultation we will determine the best course of treatment for you based on a variety of factors such as hair color and hair type. Typically, we recommend a series of six treatment sessions to provide the best aesthetic outcome. Laser hair removal technology can only affect hair in active phases of growth, so several treatments are needed to affect all of the unwanted hair. Yes. In fact, the area needs to be freshly shaved before your treatment session. You may shave the area the day before the treatment or the day of the treatment before coming in for your session. But you should not wax or pluck the hair during the course of your laser sessions. It depends on which area is being treated. In general, face, underarms, arms, and bikini are approximately 4-6 weeks apart. Back, chest, and legs are approximately 8-10 weeks apart. During your consultation your treatment course will be discussed. Most people feel only a slight momentary “snap” at the treatment site during the procedure followed by a slight heating of the skin. This typically goes away after the treatment but cooling methods can be used immediately after treatment to help with this sensation. You may experience a mild, sunburn-like sensation, possibly accompanied by some minor redness and/or swelling immediately following the treatment. This usually lasts 2-24 hours. Ask your provider to discuss other possible side effects and the necessary post-treatment care with you. IPL therapy is considered a non-ablative resurfacing technique, which means that it targets the lower layers of skin (dermis) without affecting the top layers of skin (epidermis). The advantage of IPL therapy is its minimal downtime – a patient can often have the procedure done in their lunch break and return to work immediately afterwards. What to expect in your consultation? Prior to the procedure your specialist practitioner will explain the process to you and clearly define your expectations of the treatment. They should be able to tell you whether or not the results you are looking for will be achievable using this method. It is important that the correct diagnosis has been made by your doctor prior to treatment. Preparing for your IPL Session: • Avoid sun exposure in the days and weeks before and after treatment. • A topical anesthetic may be applied to the area but is not usually necessary. • Cold gel is applied to the area being treated. IPL devices often have integrated cooling systems. • The smooth, glass surface of the IPL treatment head is applied to the skin, delivering precise pulses of light to the area being treated. • Treatment sessions usually last about 20 minutes. A course of 4-6 sessions every 3-6 weeks may be needed to achieve desired results. • Most patients can return to work immediately after treatment. Side effects are minor and include: • Pain during treatment (reduced by contact cooling and if necessary, topical anesthetic) • Skin turning pink and a little sore immediately after the procedure. • Sensation of a mild sunburn (redness, peeling, swelling) that may last a few days after treatment. • Rarely, skin pigment may absorb too much light energy and blistering can occur. • Sometimes the pigment cells (melanocytes) can be damaged leaving darker or paler patches of skin. White patches or scars are rarely permanent. Laser leg vein removal offers a nonsurgical solution for removing spider and reticular leg veins in less than 30 minutes with results that are long lasting. More importantly, it is an alternative to surgical leg vein removal, which leaves no incision scars and does not require lengthy recovery. The laser handpiece will deliver light energy into your skin and will be absorbed by the blood within the vein being targeted while leaving the surrounding skin unharmed. Once the blood absorbs this energy, the vein will heat up and it will affect the vessel lining. Thus causing the vessel to constrict and eventually fade from view leaving your legs looking clear and as beautiful as ever. If you have some sort of skin discoloration, you’re not alone. In fact, facial brown spots and discoloration are the top reasons for cosmetic visits. Pigmented lesions are a result of pigmentation which is the color in your skin produced by melanin, a natural pigment that also determines eye and hair color. However, if too much melanin is produced in one area, the result is a brown patch on your skin. Too much melanin can result from: • Sun exposure • Aging • Heredity or congenital factors • Age Spots or “Liver” Spots: Smaller darkened patches usually on older adults who have been exposed to the sun for many years. These spots can be seen on the face, forearms and backs of hands. Post-inflammatory Hyper-Pigmentation: This type of hyper-pigmentation results from any inflammatory injury or trauma to the skin. For example, acne often leaves dark discoloration after a blemish heals. Rashes like psoriasis and eczema often darken the skin as well. Pigmented lesions can vary in size, shape and depth. All pigmented lesions need to be looked at prior to treatment to confirm. During your consultation we will determine if your pigmented lesions are safe to treat. Our lasers deliver precise amounts of energy to effectively treat unwanted pigment and improve sun-damaged skin. The laser handpiece is placed over the skin where the brown spot or other pigmentation sits and a bright flash of light is released. This light is absorbed by the pigment in sunspots and the blood in visible vessels, and converted to heat. The heat damages the cells that created the pigment and shrinks the vessels. Treatments are very well tolerated. Many clients describe the treatment as a ‘warm sensation’ or the snap of a rubber band. The procedure typically takes less than 20 minutes to perform depending on the size of the area or number of pigmented lesions being treated. Often you will see great results after the first treatment session but 2-3 sessions may be required for optimal outcomes. You will need to avoid the sun, tanning beds and self-tanning creams and lotions prior to treatment. There may be some medications that you will need to avoid and your physician will cover these during your consultation. Some patients experience a mild sunburn sensation for a short time after the procedure. We may apply some ice immediately following your treatment to help minimize this. The pigmented lesions will darken over the next few days. The area will look a bit “dirty” or dark for about a week. Over this time, the treated skin will slough off, revealing fresh new skin. Typically, you can resume regular daily activities immediately following treatment. Makeup can be applied to the treated area immediately, if necessary. It is extremely important to apply a moisturizer with SPF30 sun block and avoid sun exposure on a daily basis to prevent additional sun damage. Our laser specialists can give you a consultation and talk with you about your skin type to confirm if you would be a good candidate for this treatment. This will often depend on the pigmented lesion you have. For some brown spots, only a single treatment is needed, for others, a series of treatments may be recommended. Often you will see improvements within a couple weeks, with further improvements on subsequent treatments until you have achieved the over-all improvement you desire.